Subject: BlacKkKlansman is released in theaters this Friday. Theory: Netflix series She's Gotta Have It is underrated. If you're a person who has any interest in film, you'll have an opinion on the director Spike Lee, whether it's as a purveyor of the black experience or one of the most radically impulsive and unsubtle filmmakers of the past 40 years. Whatever the case may be, it's incredible to think that his latest film BlacKkKlansman is also one of his most acclaimed and popular films of the past 20 years. It's odd, if just because films about Klansmen don't tend to get a lot of attention. With that said, 2018 has been a summer for oddball films from black directors. There's also director Boots Riley's surreal Sorry to Bother You, which was one of the year's indie hits that nobody saw coming. Still, Lee is an undeniable icon, pushing for black filmmakers often more than anyone in Hollywood, including during his Honorary Oscar speech a few years back. In fact, he's been supportive in getting The Academy more diverse while being critical of its many faults during the two years of Oscars So White. But what is there to say about Lee in terms of Theory Thursday? The general opinions have been laid into place a long time ago. Films like Do the Right Thing, Malcolm X, and The 25th Hour are genuine masterpieces. He's also wildly uneven elsewhere. It's why I decided to turn attention to the realm of TV, where he was royally ignored last year in ways that many of his peers weren't. If any major filmmaker did a Netflix series, there would definitely be an uproar of anticipation over its potential contents. But for Lee, She's Gotta Have It - a series based on his breakout movie of the same name - didn't register in any meaningful list. This could be that Dear White People has become Netflix's premiere series on black identity, or that it was released too late in the year (which is probably closer to the truth). The only thing that was noticed is that it's coming back for a second season, and odds are that it will gain a lot of traction after BlacKkKlansman becomes the sleeper hit that won over critics at Cannes and maybe even your local audiences. I can't claim to be knowledgeable of everything that Lee has done. I've seen some of his films, and I generally admire what he does right. He's made some odd choices, such as the Kickstarter-funded Da Sweet Blood of Jesus, but he's generally an interesting filmmaker. It's partially what made She's Gotta Have It a compelling series to make in 2017. Maybe it's just that he had a lot of ideas following the controversial 2016, but what he created had an immediacy to it that showed in a lot of his work. In one episode, he even explores America's modern racism through a music montage that is some of the director's most provocative work. It breaks the fiction in favor of images of how America is torn not just against black people, but against each other. Lee has always been critical against racism, but that one segment alone could've justified the series. 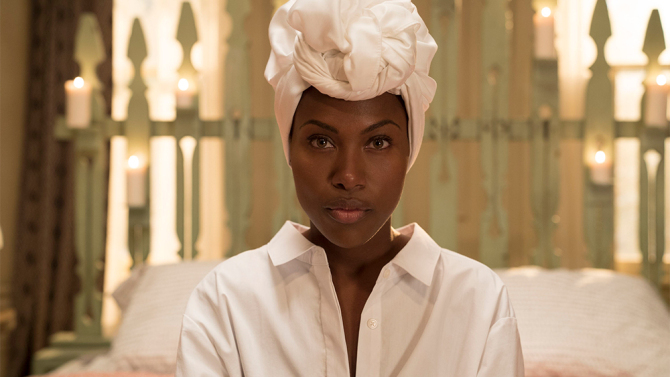 More than the youthful naivety on display in Dear White People, She's Gotta Have It focused on Nola Darling's (DeWanda Wise) struggle to be an artist of merit. 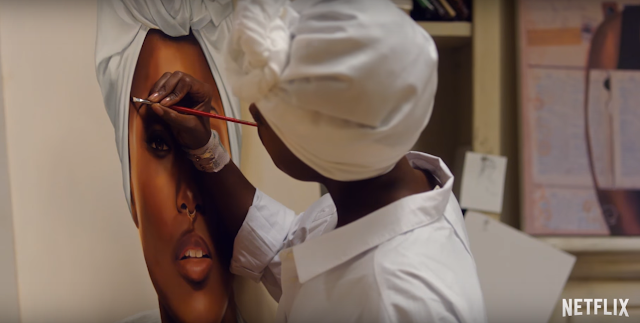 She has a great gift for painting, but her personal life is a little more complicated. In a sense, Lee seems like an odd choice to be exploring black youth in 2017, especially when every title is done in a trendy hashtag fashion. However, it's incredible to see his characters updated in a way that never feels dishonest. Instead, they're all just as familiar as they were in the early 80's. There's an exploration of art, along with the confusing merits of loving black art while enjoying the eclectic works from white artists. Nola is also promiscuous and sometimes explicit in her sexuality, coming across in ways that few series (even on Netflix) feel the need to explore. While Dear White People and HBO's Insecure may also help change the notion of what a black woman on TV looks like, She's Gotta Have It feels rawer, more experimental and reflective of the artistic struggles in all its forms. If nothing else, She's Gotta Have It may be among Lee's most playful works in recent years. There's plenty going on in terms of character dynamic, but it's not meant as some provocative piece of revolutionary art like BlacKkKlansman. It's just meant to give a perspective that is unique to Lee, and is plenty entertaining. Wise in particular is magnetic in her performance and makes the whole show more compelling. She may be a compelling force for haughty opinions, but the show is also recognizing of her mistakes as a person. It's a well rounded character, and one who exists in a world that's never lacking in compelling imagery. Lee is using every trick he's gathered throughout his career while applying it to a contemporary context. It's present in Nola's trip to visit dead poets, or dancing to Prince's "Raspberry Beret" where Lee wants to show younger filmmakers how to make something that both seems conventional but is full of layers and compelling imagery. The one thing that works so well is that She's Gotta Have It is a show that doesn't exist solely as name recognition. It's not a cynical remake like Fuller House where the whole existence is to feed off of its existing popularity. Lee may have that in his own niche way, but he doesn't make art randomly to appease a higher calling (well, except Oldboy). He's frustrating because of how singular his visions often are, and it's great to think that he's still got something important to say. Even if She's Gotta Have It reads like minor Lee to most people, it's still one of the best shows on Netflix and it's a shame that it got ignored last year, albeit in a late release that already saw a crowded field for best shows of the year. Sure, Dear White People and Atlanta already have black filmmakers making the cut (and Insecure's not far behind), but hopefully whenever season two of this show is released, it gets more recognition than what it had last time. It deserves it oh so much more than their other shows often do.